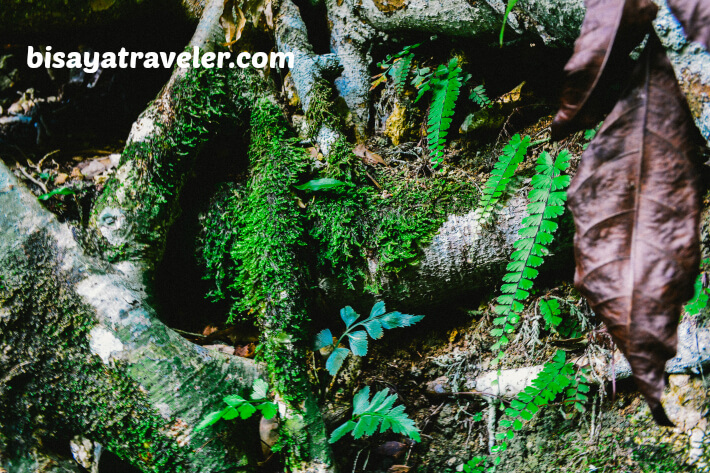 The Philippine Mythology is, to me, a cultural treasure and a patchwork of inspiring tales. From the inhumanly strong Bernardo Caprio to the mountain goddess and her golden galleon in Argao, I’ve heard and read plenty of intriguing Philippine mythical stories that made my childhood pretty awesome. Not to mention, these tales kept me at bay, whenever I had an urge to wander at night around the neighborhood. But with the recent upsurge of social media and sci-fi films, the Philippine folklore is sadly becoming a lost art. Even though the Philippine Mythology is extremely fascinating, today’s youngsters just don’t know a lot about it, and would prefer to recount the adventures of foreign mythical characters like Thor, Spiderman or Edward in Twilight (God I hate that series). 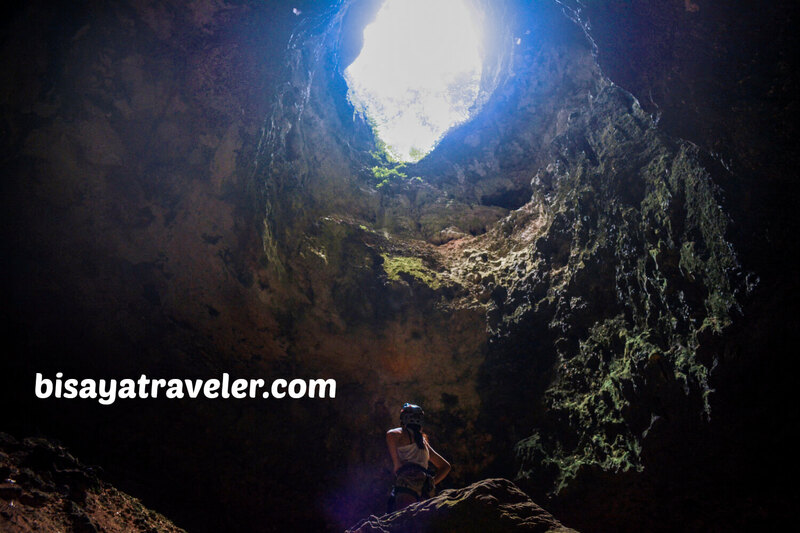 Fortunately, traveling around the Philippines can introduce or reconnect younger generations to our fables. In our recent travel, me and my partner bumped into two of the most famous mythical icons in Cebu – Maria Cacao and her gigantic husband Mangao. 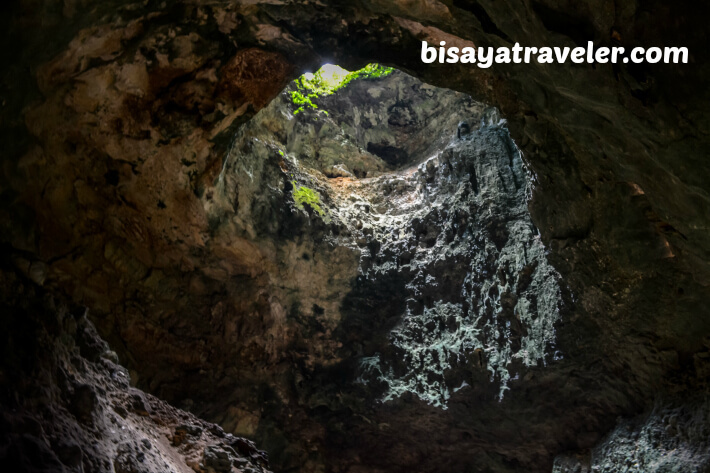 And we weren’t just treated to an insightful story about these legendary figures, but we also stepped inside their dark labyrinth, fondly called as “Balay sa Agta” in Argao. 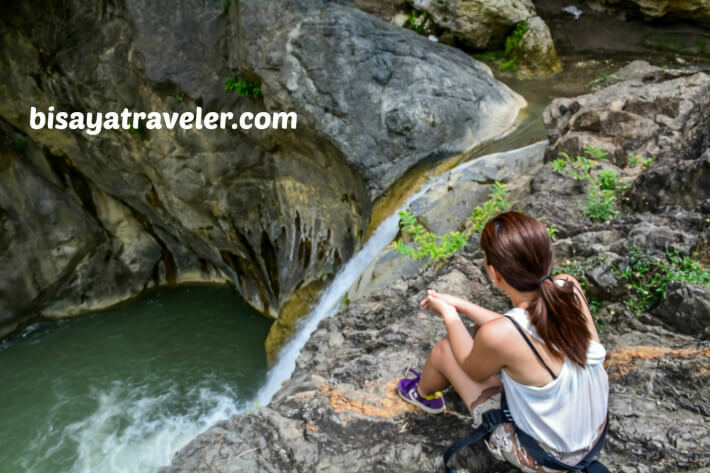 A day prior to our tour, we reached out to Argao Tourism Office to arrange our little adventure to the mysterious cave and Bugasok Falls. I was advised by other bloggers to contact them at least a day before our visit, for the reservation of our guide. And, we were assisted and entertained by Jotham – the tourism officer in Argao who did quite an excellent job in handling our tour. 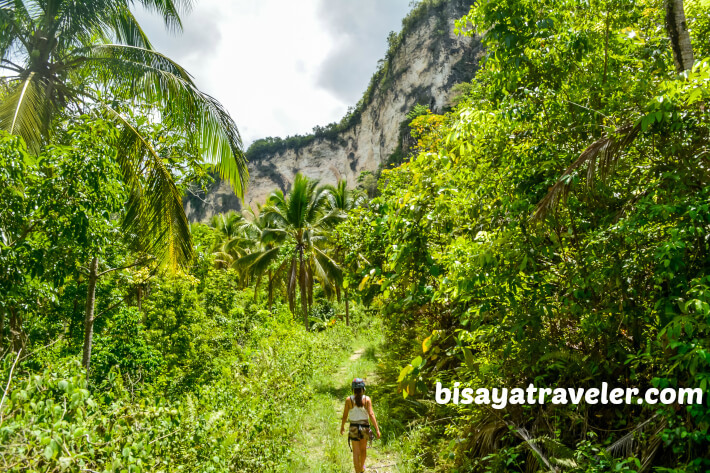 From the get-go, Jotham told us everything, from the appropriate footwear to the ideal time of visit, we need to know about this one-of-a-kind tour in Argao. 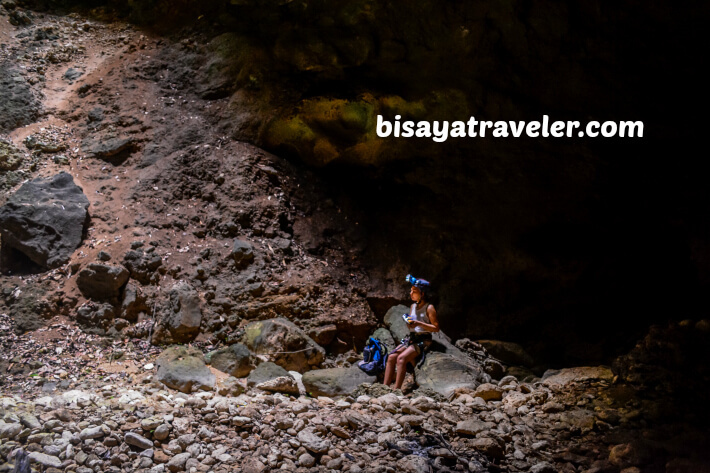 As for the rates, the package costs 600 PHP per person, which includes cave equipment rentals, entrance fee, guide fee, back-and-forth habal-habal transportation as well as a delicious snack combo (torta and a cup of sikwate). Getting there is pretty easy, especially if you’re from Cebu. From the Cebu City South Terminal, hop on a bus bound for Argao, and ask the conductor to drop you off at the municipality’s bus stop. Travel time is 2 hours, and fare is around 65 to 80 PHP, depending on the liner and type of bus you take. Once there, take a tricycle ride (fare is 7 PHP) to the Municipal Hall, or also referred as the Casa Real. 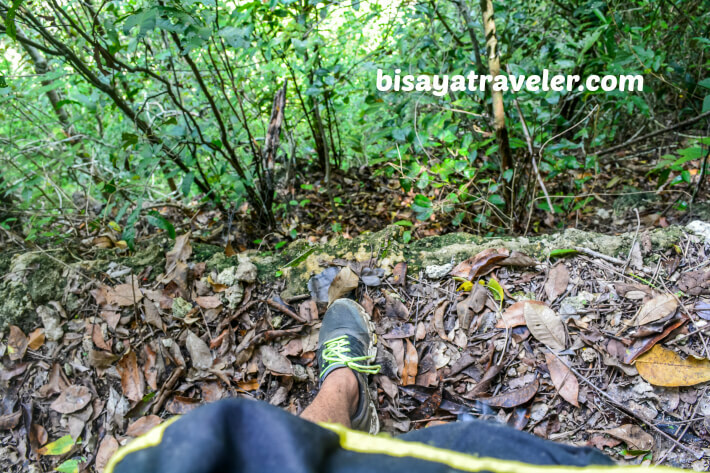 Now that I already got the details covered, it’s time to share our awesome experience in Argao. The starting point of our trip was the Argao Toursim Office in the Municipal Hall. As a photography enthusiast, I was utterly amazed by the beautiful historic buildings in the area. Sadly, though, we didn’t have the chance to snap photos of their historic jewels. As soon as we stepped inside their tourism office, we were greeted by a couple of friendly gentleman who offered water and a couch for us to rest. While we were resting, signing the papers and making final preparations, our guide was setting up the headlights, flashlights and spelunking gear needed for our tour. We were also waiting for Elias – the habal-habal driver who took us to the falls and mystical tavern. And then, the adventure began! We hopped on the habal-habal and went for a thrilling and bumpy 1-hour ride to Conalum Barangay Hall from the Municipal Hall. While it was quite a long ride, it wasn’t boring by any means, thanks to the beautiful mountain scenery of Argao. Plus, the place was serene, making us forget the blistering heat of the sun. Eventually, we arrived at the Conalum Barangay Hall – the jump off point to Balay sa Agta – to register. 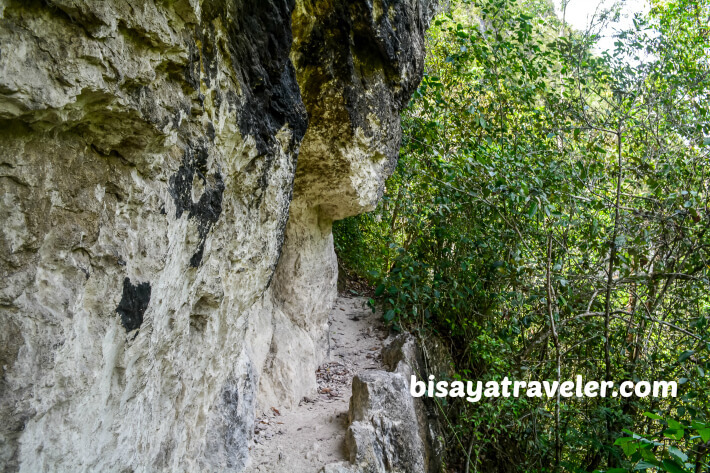 Since there was no one around in the barangay hall, our guide decided to move on, and take a short trek to the mouth of the cave. The trek, although it was short, was rather challenging, even for a moderately fit guy like me. At first, the trek was so easy and enjoyable, with plenty of eye-catching trees and verdant vegetation around the area. 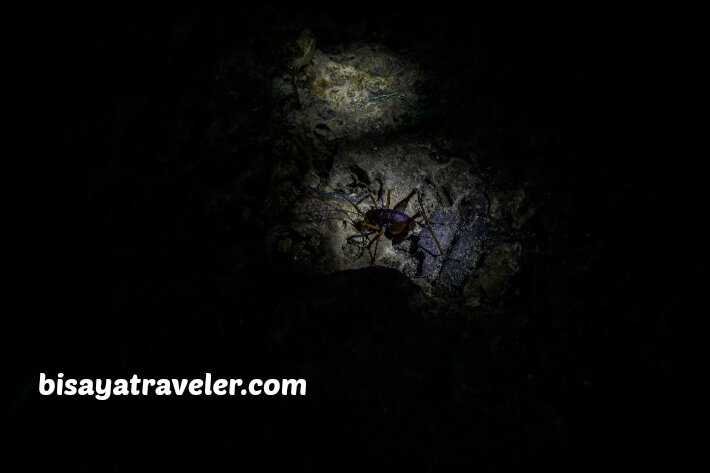 What’s more, there were beetles and birds producing melodious sounds, as we were making our way to the cave’s mouth. But, the trail became very narrow, as we went forward. In my own estimation, the width of the trail is about 12 to 20 inches. To make things even scarier (or more fun), there’s a cliff beside the narrow trail that probably measured around 60 feet deep. Trust me, you’ll have to be extremely careful, when trekking this part of the trail. According to our guide, there was a seasoned mountaineer who already tripped and died in this precarious trail. Scary, right? But unlike the unfortunate mountaineer, we had a local to guide us through the trek, and we were also equipped with a harness and a set of safety equipment, to ensure our safety. So, don’t be afraid to try this mind-blowing experience, folks. Then, we finally got a good full view of the cave’s mouth, and by the looks of it, it really appears like a house fit for a mystical gigantic creature. 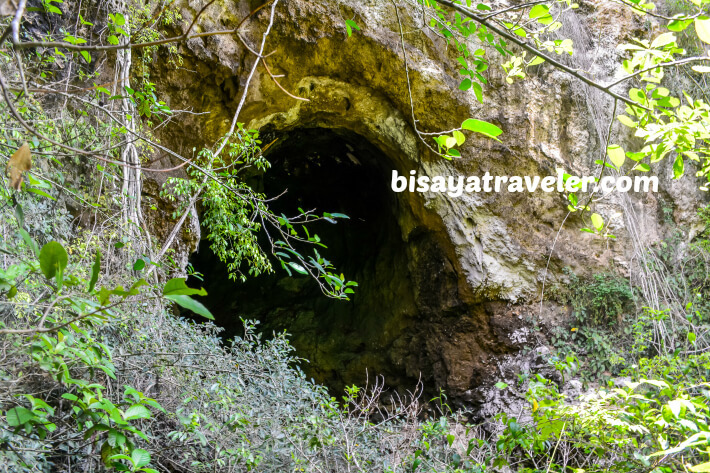 After crossing the most challenging part of trail, our guide gave us a briefing on what to do, what not to do, and what to expect inside the cave. Then, we step inside the cave, and encountered a plethora of pleasant surprises. 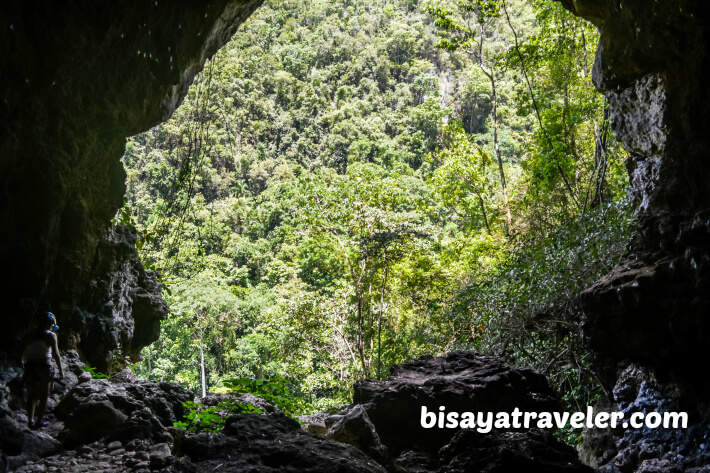 From sparkling rocks and charmingly rugged landscapes to extraordinary insects, there were heaps of amazing discoveries along the way on this 480-meter long cave. And, the place was very cold too! 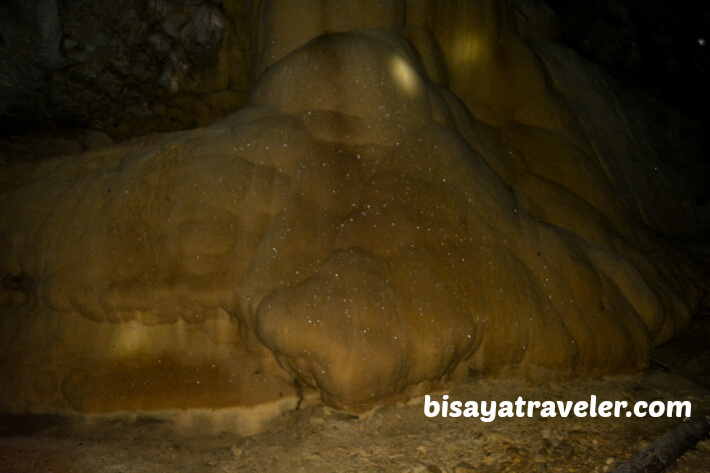 Our guide and driver joked that Mangao – the Agta (giant) living inside the cave – turned on his aircon unit for us. How nice of him! In midst of our tour, we saw a big hole above the labyrinth that formed a breathtaking view where the sunlight from the outside passes through. 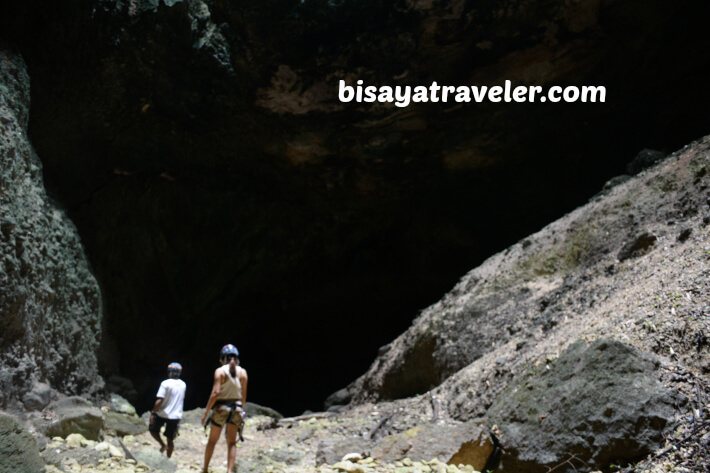 Personally, it was the highlight of our spelunking adventure in Argao. As we moved on, we discovered a few more awesome things, including the area where there’s total darkness when your turn off the lights. When arrived at the near end of the cave, the guide showed us an altar where people in the previous generations would send letters to ask help from Maria Cacao. Later on, our guide took us the end up point of cave, and asked us to turn off our headlights. He instructed to us to take a look at the rock formation above us. And guess what? We saw a rock formation that looked like a gigantic being puffing a tobacco. Our guide said it was Mangao himself watching over us. I tried to snap a picture, but I couldn’t get a clear photo of him. As they say, no one has yet to take a clear photo of him in this part of the cave. Maybe, the legendary Agta of Argao isn’t as photogenic as most millennials. The entire cave tour took around 45 minutes to an hour. You’ll also need to take the same trail to get back to the jump off point. 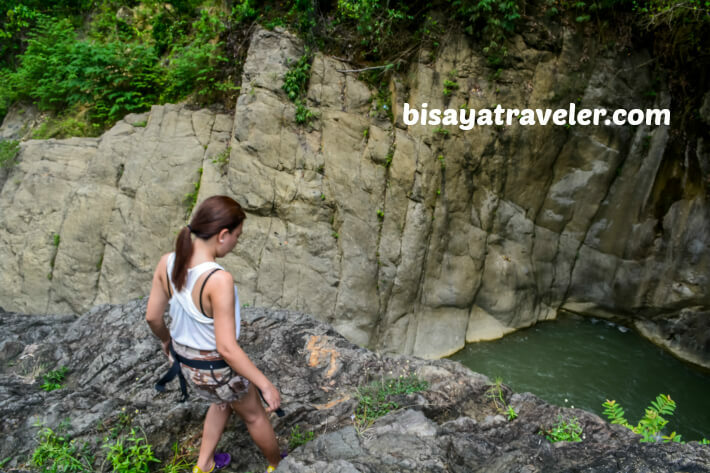 We took on a 10-minute habal-habal ride to get to the next stop of our excursion – the Bugasok falls. We we’re thrilled to see it, but unfortunately for us, we couldn’t take a plunge on this spectacular waterfall since the water was murky at that time. Nevertheless, it was a great stop for photography’ sake. That’s a really beautiful cave there. We haven’t been to Balay sa Agta although we are here from Cebu. We should put this in our bucket list. Yep, it’s a thing of beauty. Since you guys love the outdoors, I think you’re going to have a blast there. Who would have thought that Argao has all this Gem. You’re taking me to the deeper side of Cebu with all your amazing adventure and discoveries.